I too want to add my thanks to captain semper. Though mine was probably one of the smallest vows in the competition between work, life in general and a little baby girl at home it was good to have something to encourage me to take a little time and do something for me. Here are my meager contributions. Taunt Marine found that thing you were looking for and cordially invites you to come and retrieve it. It is a can. He may even open it for you. Raz, you sell yourself short mate. That black and purple colour scheme of yours is ace and I really dig the tank. Very characterful. AS I said in the traitor fourm that Bites. No worries, mate. Have you tried the litany of connection: "Quid ergo est, et conversus iterum ageres?" If blown into space, hold your breath, recite the litany of the vacuum, make swimming motions towards the hole in the hull and await pickup by rescue crews. Thanks to Captain Semper for the ETL organization (and any others that I missed). Official advice from the Imperial Infantryman's Uplifting Primer, too. A bus left the Scarlet Devil Mansion; three people boarded at the start. At Hakugyokurou, one left and half a person boarded. At Yakumo-san's house, two people left; so how many passengers in total? The answer is zero people because there are no buses in Gensokyo! Thanks again for running this Capt. I cant even imagine the work that goes into it. The mighty Armies of Humanity had fought each other utilizing every resource in their disposal. The end result was nothing short of total devastation. Brother Neria, the Consecrators’ Veteran sergeant of the 6th Company was looking at the carnage in disgust… The bodies of the Emperor’s finest, tanks’ and flyers’ wrecks were littering the battlefield. In the distance the foul banner of obscene Deities was flying in the high ground. He turned to the wing-helmeted figure next to him. - This cannot be allowed Master. We must launch the final assault and erase this blasphemy once and for all! The Master of Recruits was silent. He knew that the Emperor’s forces were spent. Any further attack will only serve in expending resources with no material result. Was this the will of the Inner Circle? He smiled to himself… Then he turned to his Veteran Sergeant. - We will Neria, we will… next year! REALM OF CHAOS: E TENEBRAE LUX III CHAMPIONS!!! From the above you can see that the metric that measures commitment (completion rate) was exactly at ETL I levels while the total completions were 2.2x more! Seriously, this year was plain crazy!!! This year there was an expansion of the units allowed as FW lists became ETL legal. This helped people to build and paint units they really wanted to do and gave the opportunity for some very impressive models to find their way to the ETL Strategiums, fully capturing their intended points. I’m really happy this worked well and you can be sure it will continue in the future as a standard feature. I think what really emerged as a dominant theme this year though, was the super-mega-vows (for want of a better term). When the ETL started back in 2012 a vow exceeding 1,000pts was termed “mega vow”. It just seems funny now… This year, we had 4 vows above the 10,000 mark (all completed by the way) and a very large amount of vows of 3k+! Now 3k is roughly the upper limit for which 40k was designed around and the entry level for Apocalypse. So effectively we had a number of participants who build entire armies in 3 months – a huge undertaking and highly rewarding experience. It also served one of the ETL main aims, namely to beat procrastination! 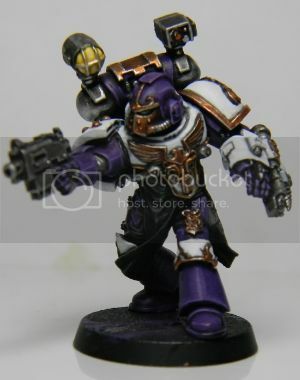 However another major aim of the ETL is to paint to the best of one’s ability and if possible to improve the skills/techniques involved in doing so. It is a good opportunity too as all skill levels come together in the Strategiums and we have the entire wealth of B&C concentrated in one place. It’s very easy to ask for advice, share your problems on techniques and paint schemes and (why not?) experiment a bit. This is very difficult if you are under the clock and any deviation from your comfort zone can spell disaster. The balance between painting massive amounts of minis to one’s usual standard (or, let’s face it, sometimes below the usual standard) and improving one’s overall painting through the interaction with other frater is a fine one – and I’m afraid not always achieved. It is important to remember that the models will stay with you long after the ETL is over. As such this (super-mega-vows) may be an area of rules tweaking in the future. So enough of that, let’s see what happened in this year’s ETL. The weekly completions were very strong since Week 1 with an average of 20k pts completed per week, ignoring the highly distorting last week. This resulted in beating last year’s performance already from Week 12. But then came the last week, Week 13. What WAS THAT?!?! 147k pts in a single week! I was really trying to keep track as completions were reported left, right and center and more were coming in all the time. And I thought last year was bad… When I turned to the Dark Gods for help all I got in return was their cruel laughter! ALL HAIL THE DARK GLORY OF CHAOS! FOR THE WARMASTER AND THE DARK GODS!!! Let’s get one thing out of the way: the Black Templars are an ETL super-power! They have won the first one, came second on the second one and are now fourth but with a higher score from both the previous ETLs and really close to third position! As such, and given their continuous momentum and identity despite being merged into the Codex: Space Marines, they will always remain a distinct faction in the ETL. The BTs managed to maintain an above average completion rate up to Week 8 and then remained broadly in line with the average until the last couple of weeks (Week 12 & 13) where the managed to beat the average again. Their best week, Week 6, saw the most completions in absolute and relative terms than any other forum representing more than 1/3 of all the completions of that week. However after that the momentum subsided and they just maintained their position close to the top without taking the lead again. In the last week though, they sprang into action, in true Templar habit and added a substantial 20k to their total – the third largest weekly contribution of the ETL! The real reason the BTs did not go higher in the rankings though is the low average vow. Everything else worked fine! High completion rate, high participation, high re-vowing rate… But with relatively small individual vows, it meant that the completions did not add to the total to the extent other factions did… With 629pts/vow on average it meant it was a good 140pts below the ETL average. Given Chaos’ performance and the BT average vow, you’d win that on a 100% completion rate on 157 vows of 629pts per vow on average or 128 vows on the ETL average vow. That's the kind of turnover required and I don;t know if that's even possible. This is where, in this ETL, a super-mega vow would come in handy. The Angels of Death is a diverse faction comprising of many different Chapters grouped together on the fact that they share the same Codex. This creates a common purpose but also internal rivalry! Before I go into detail, I would like to point out that Arizonajirt, the Faction Champion, accounted for 29% of the faction’s total. The title of Champion is well deserved. The most fun part though was to see how the several components of this faction behaved. In the beginning it was hard to find a single IH to join! As it happened not only 5 of them joined eventually but they all completed ALL their vows making it a 100% completion rate group! Well done guys. On the other end of the spectrum, it took the last week for us to see a couple of completions from the UMs camp (both were of outstanding quality though) and single completion from the Salamanders (equally of outstanding quality). The WSs managed a 54% completion rate – not bad considering they also suffered from late completions… Obviously the Champion’s Chapter (RG) came on top but with both the IFs and the IA lending valuable support. The faction managed to remain ahead of the curve of completion rates as Arizona’s completion came in in Week 3 and then his subsequent completions of 4k+ pts each continued to carry the Faction to significantly higher completion rate compared to the ETL average. However, Arizonajirt was not unsupported! The entire faction mobilized maintaining high completions in absolute terms and with some extra boost in the last week, the AoDs secured the third position! Great performance overall guys – and most importantly: ONLY 155 PENALTY POINTS! That’s how the Emperor’s finest roll! 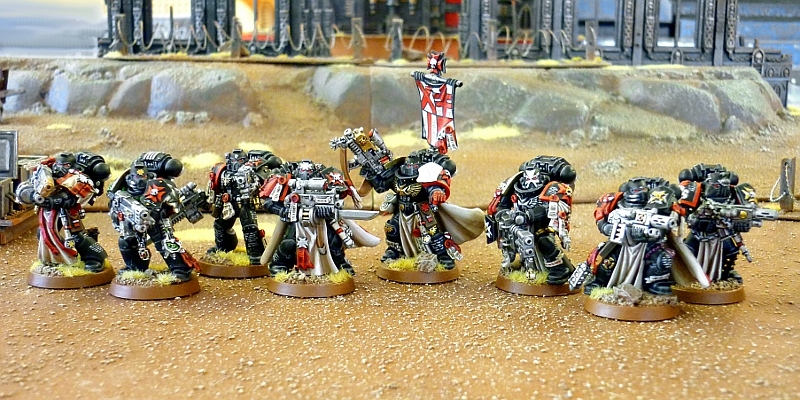 The Blood Angels had a subdued performance throughout the event but in the final stages they sprang into action adding 100% of their cumulative performance up until Week 12. They started off really slow and by Week 4 they lagged 10 percentage points compared to the ETL average! Although the gap improved in Week 5 it gradually started to widen again to almost 15 percentage points difference by Week 12. The last week saw a strong effort to regain some of the lost ground and the gap narrowed again but it was not enough to guarantee a higher positioning. Apart from the limited resources and low completion rate there was a third problem that hampered the performance of the BA faction: One of the lowest average vows in the game. This created an impossible situation. A low average vow can be turned into an advantage if there is a large turnover – i.e. high completion rate (especially early in the event to give a good head start). It appears that the BAs were unwilling to commit in any big way this year and the result was that their total completions were slightly below last year’s levels – one of the two faction to do so (the SWs being the other one). On the positive side, the participants showed commitment and talent worthy of the renaissance-like Chapter. Hopefully next year we’ll see the numbers swelling, and who knows? A new codex maybe? The DAs admittedly had among the highest number of participants and like the BTs lacked a crazy super-meg vow, so all this performance was in fact distributed among the frater to produce a result where every single vow mattered… And, if the DAs can brag about something it’s the fact that (marginally) they had the highest completion rate this year at 77.6%! This is the second time the DAs are getting second position in three ETLs and, since they are one time Champions, it means that they are a force to be reckoned with – the benchmark of the ETL! Hopefully next year they (we) will claim the top position again! The SWs had the lowest amount of participants this year and this created a problem from the start. The other problem was that their average vow of c. 650 pts stood well below of the ETL average. The only way to counter these disadvantages and turn them to an advantage is to increase the turnover – i.e. to complete the small vows early on and re-vow (again small amounts) in order to counter the large individual vows that take more time to complete with a number of small quick ones. The SWs with all these single Character units offers a lot of opportunities for this type of play. Unfortunately it was not to be. The completion rate remained significantly lower than the ETL average up to Week 10 and then the Wolves sprang into action – but it was too late to challenge their rivals as time did not permit large scale re-vowing and although the gap in terms of completion rate narrowed, in absolute terms they were not in a position to challenge their rivals. A note I would like to make here is that on the very next day that the ETL finished a new SW Codex was released! The release of the new Codex was rumored throughout the life of the ETL and it could have been a factor that the SWs were unwilling to commit... Hopefully, next year, with a new Codex, the SWs will take their revenge! Chaos is wonderful! These are the Champions of the ETL III and deservedly so! They have the highest amount of points pledged (ever) the highest amount of completions (ever) and it’s the first faction to get above the 100k mark of completions before penalties (ever). Since the beginning Chaos had a huge drive in this ETL. Not only they had unusually high participation compared to the previous years, they went to the extent of creating a convoluted system of vows and even a mini satellite event to boost morale and enhance their drive. They were also blessed by the Gods to have three of the four vows of 10k+ (steve shields and Fasha the Dog) and to have the Champion of Champions with them: steve shields who despite some personal issues, delivered the most points anyone has ever delivered in the ETL. But Chaos would have been on the top positions even without the super-mega vows – that’s how driven our depraved frater were this year! In fact, other things been equal, Chaos would be ONLY 307 points behind the DAs – and that’s where the motto: “every point counts” would kick in. Regardless this was a solid win, with the aspiring Champions of Chaos driving the Lost and the Damned to ever higher levels of frenzy! By looking at the graphs above, Chaos was below the ETL average completion rate up until Week 8 but were never much behind (if at all) in the absolute amount of completions – given their high level of pledges even lower completion rates guaranteed a high absolute total. Then in Week 9 (a semi-magical week for all ETLs) steve shield’s first completion came in boosting the completion rate to above the ETL average where it stayed until the end. Congratulations to Chaos – the Champions of ETL III and Primus Inter Pares! The Forces of the Imperium is another diverse faction that combines a number of Codices. The major force among them is the IG – the latest addition to the B&C forums and the first to break away from the power armour theme. The IG in itself is a very diverse force comprising of cheap infantry to large and expensive super heavies. 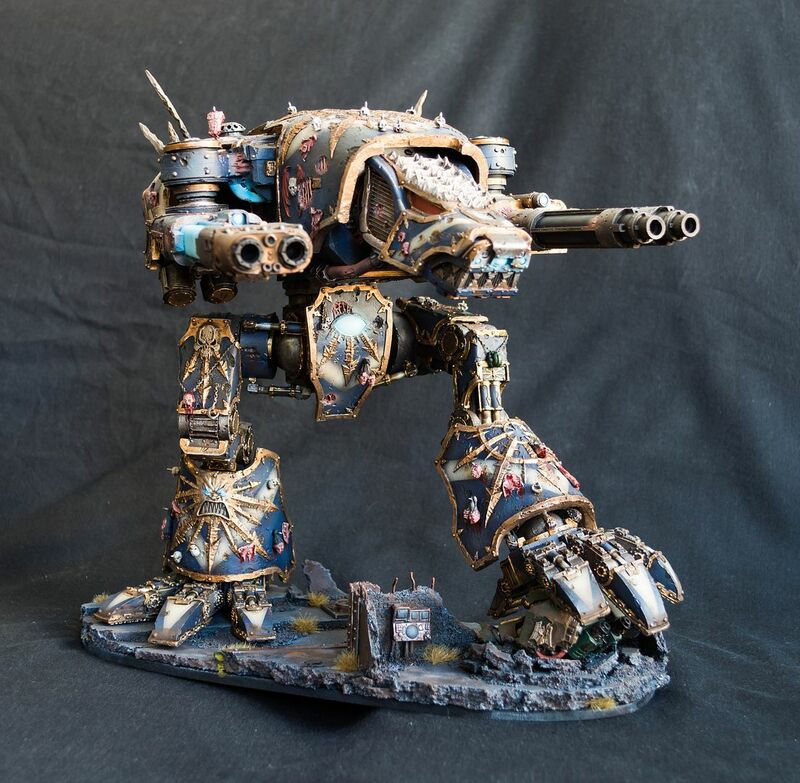 I expected that the changes in the ETL rules that allow virtually anything that comes out of GW/FW to significantly aid this faction as now they were not only limited to the Codex’ tanks (many as they are) but to the myriad other vehicles that are described in the various FW publications. Although tanks did make their appearance the good ol’ guardsman won the affection of the participants and as such the vows, although model intensive, the points associated with them were not that many. Which is a good thing in actual gaming terms! A final note on the Guard is that last year, being the new kids on the block, they had ONLY 7 participants and completed 8k pts between them. This year they had 30 participants (more than 4x more than last year) and completed 19k pts!!! I have to say the mods of this forum (or should I say Commissars?) must be doing something right! I really liked that the Mechanicum made an appearance with two(!) Knights both completed on time and the GKs managing a 54% completion ratio and having the Faction Champion coming for the ranks! The SoBs had a very small participation adding 770 pts to the total but I think the limited support for this faction by GW has its effect on the community. Oh, did I mention no penalty points? Well done guys! The HH forum asserted itself as a major contestant in the ETL – a presence that’s here to stay! The armies of the 31st millennium were represented with the respect that those warriors of old deserve. There was high participation, the amount of points pledged quite similar to all the major players at 70k+ and their average vow almost spot on to the ETL average. However their lower than average completion rate kept them in 5th position. I think the week that cost them the most was Week 5 that saw the completion of a single EC apothecary (but what a mini that was) and then the hallowed Week 9 where their completion rate gap (compared to the average) widened. Despite some strong performance in the last weeks of the event the HH forum never went above the average completion rate and although equal in points and vow size to their immediate rivals it meant that they could not threaten a higher place. But let’s face it. This is an emerging force, with the Traitor’s already having the biggest share of coverage. The 40k “big 4” have yet to be covered by FW and there are also other more esoteric areas of the Heresy that has yet to be touched upon. So this is the beginning, this faction delivered 14k pts last year and 47k pts this year. The following is on the rise and this is the faction to watch in the future ETLs! The ETL is not only about faction performance. It’s about individual performance too and some amazing feats of glory have taken place this year. Now, just like last year, those you completed ALL their vows will be awarded the Custos Fidei. This badge replaces the Oath of Moment and denotes the number of completions by presenting a “Seal of Completion” for each one. So someone who has made a single vow and completed it successfully he’ll don the Custos Fidei with the single Seal of Completion. One who has made two will don the Custos Fidei with two Seals of Completions and so on. So the participants who completed 5 vows are awarded a Custos Fidei with 5 Seals of Completion! If you don't see your name below or you see it in a wrong place do not reach for your bolter. PM me and I'll sort it out. In the mean time feel free to use the badge you deem appropriate! Edited by Captain Semper, 20 August 2014 - 07:10 AM. The Badge of the Martyr: This goes again to steve shields as he managed to complete more points than any other participant: a total of 27,187 pts. Again congratulations! This is awe inspiring stuff! Augustus b'Raass, you're awarded the Badge of the Artisan! Congratulations! But we're not impressed only by the super-sized models (impressive as they are). Here's another mini that I really admire: a EC Apothecary! kizzdougs, you're also eligible for the badge! Congratulations! Mike Zulu, please take your badge! Well the third ETL is over. I would like to take this opportunity to thank everybody for their participation, effort and conduct. This event makes me very proud to be counted in the best internet 40k community around! To those who completed your vows you can proudly wear your Custos Fidei while those who did not complete, there is always next time! This year Chaos made a huge effort. The mobilization was unprecedented and the drive and motivation out of this world (well, it makes sense). This was a surprise to me as in previous ETLs Chaos was a mid-of-the-range faction that never threatened the top positions. I have to point out here that even without stave's and Fasha's colossal vows the rest of the team managed to equalise the Dark Angles performance - the second best score ever (even surpassing last year's score that made them Primus Inter Pares). On the other end of the spectrum, the Space Wolves seemed less interested this year than any of the previous ones so participation was small. And so were the vows - with the exception of WLK and Arez who did vow thousands of points each. I think that the rumored new Codex (which eventually came out the day after the ETL was finished played a big part in the Wolves stance as it's reasonable to wait for the new 'dex before you commit your money and time to a project. Before I close I'd like to thank the Admins (Kurgan and Brother Tyler) for allowing the ETL to run again and for supporting the concept. I would also like to thank the Supreme Grand Master of the Inner Circle The Shadow Guard himself for giving so much of his time to shape the imagery of the ETL! This event would be nowhere without him! Looking ahead, there are other events in the pipeline, like the Call of Chaos and the Loyalty and Treachery and who knows what else? Stay tuned! So until next year, farewell! Edited by Captain Semper, 20 August 2014 - 07:11 AM. Congratulations to everyone who participated. Nicely done one and all. Slightly upset that Chaos won, we must rectify that next year brothers. Edited by ShadowSong7007, 04 August 2014 - 03:02 PM. Well done all - thank you! The wages of sin is death...DEUS VULT!! Oh yesssssss!!! Sorry, ment, well done everyone. Will you be making the smaller badges (i.e like the one already on my signature)? Also, I'm looking forward to your take on Cypher! As always I'm impressed with the level of detail the write up goes into I truly appreciate the time and effort you've put in the last three years Cap, looking forward to next year. Well done everyone! Was great fun! Well, I must admit I don't really like super-mega-vows that much in the context of the ETL. It's a community event, and to me it somehow feels thatsingle individuals shouldn't have THAT big of a role. I mean, of course 40k is a world of great heroes as well as of common troopers, thus giving some parity to mega-vows and normal vows, and in a sense seeing such big vows is even kinda cool, but when a single individual ends up painting more than some entire factions, it just feels a bit... off, in terms of the greater competition. Of course there may not be a simple alternative to this that everyone would wholeheartedly agree with. Artificial point caps per participant and what not may upset some people, for example. Location:The Labyrinth, realm of limitless eternal pain and pleasure . AKA Kings Lynn, Norfolk. and thanks to semper for running the comp, its been a blast. Unbearable, isn't it? The suffering of strangers, the agony of friends. There is a secret song at the centre of the world, and its sound is like razors through flesh. ''Help! Help! I'm being repressed!!!'' - Dennis the Peasant, England. 932 A.D. Awesome fun, thanks for the event Captain, being new the the ETL I had a great time. "Look for the black knights among you, we will be where the fighting is fiercest, at the heart of the storm. Stand with us, and we will be your salvation." ...but when a single individual ends up painting more than some entire factions, it just feels a bit... off, in terms of the greater competition. Of course there may not be a simple alternative to this that everyone would wholeheartedly agree with. Artificial point caps per participant and what not may upset some people, for example. I think that those people are worthy of honour, nonetheless and perhaps more so. Appreciate some factions are inevitably smaller, but if people have collections that large and use it to complete great chunks - kudos to them. Given there are so few of these occurring, it's not a massive issue - and it's so, so impressive to see visually. 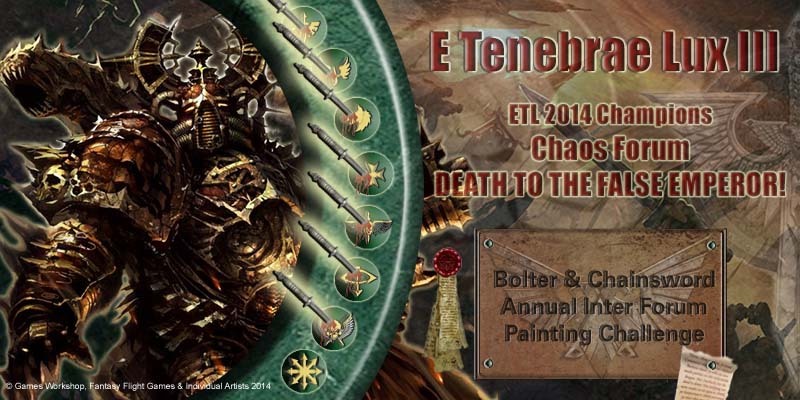 I'm now going to enjoy checking out what the competition painted during the course of the ETL - as I've truthfully only mainly seen Chaos and the Horus Heresy forums!